I'm not entirely sure when - or why - the functionality was removed, but at some point in the last couple of OS X releases, the ability to three finger swipe an application via the title bar to move the window was removed. With the release of the El Capitan Gold Master release earlier this week, I took to figuring out if the functionality could be brought back. Luckily, it's a simple change you can make. 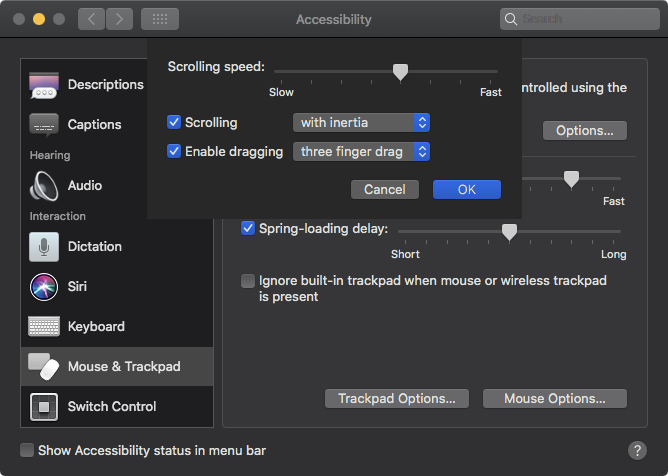 Open up System Preferences, click on Accessibility, then Mouse & Trackpad under the Interacting sub-item in the left hand scrolling pane. Click on the Trackpad Options... button, and you will be presented with the following dialogue window. Simply click the checkbox alongside Enable dragging and select three finger drag from the dropdown. Now this feature will be available again.